There are days when we are just too busy to do some decent grocery shopping. 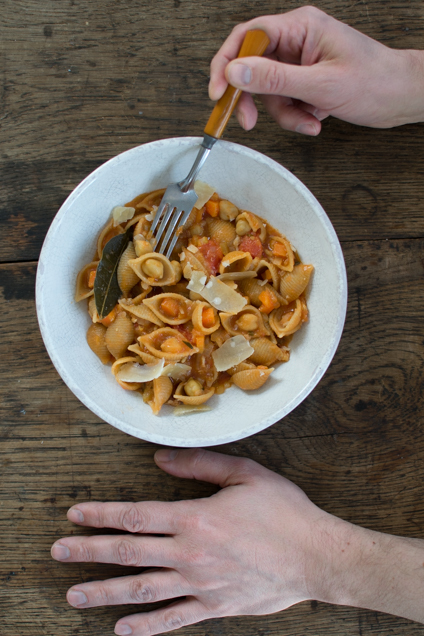 On those days we open our fridge and closets and often end up making this Pasta e Ceci (Pasta with Chickpeas). 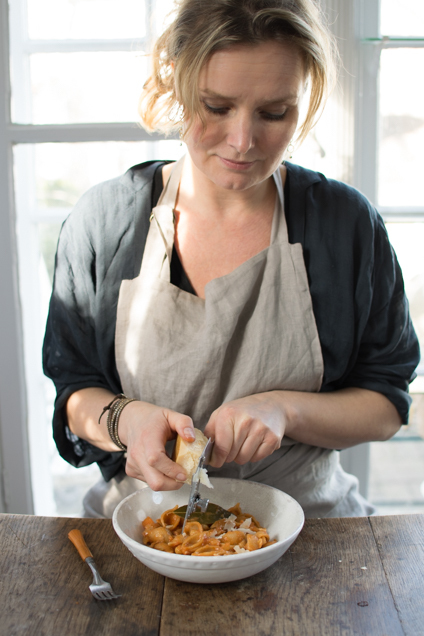 I love this simple Italian dish: it’s easy to prepare and I almost always have the ingredients at hand.My version of Pasta e Ceci is a sort of soupy pasta. I make it extra creamy by pureeing part of the chickpeas and adding the puree to the pasta. 1. Heat the olive oil in a large pan and cook the bacon 1-2 minutes over medium heat. Add onions, garlic, carrots, celery, rosemary, and red pepper flakes and cook for 3-4 minutes more. 2. Puree the peeled tomatoes with a hand blender and add to the vegetables in the pan. Pour in the vegetable broth, add the bay leaves and bring to a boil. Lower the heat and let simmer for 10-15 minutes with a lid partially on. 3. Meanwhile drain the chickpeas over a bowl. Puree 1/3 of the chickpeas with some of the liquid from the can. 4. Add pasta and chickpeas to the tomato broth and simmer for about 15 minutes until the pasta is done. Mix in the chickpea puree and season with salt and freshly ground pepper. Ladle pasta into bowls and shave over some parmesan. Serve with a salad. Leave the bacon out if you do not eat meat or don’t have it at hand: it’s also delicious without.